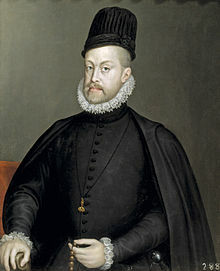 Philip II of Spain (May 21, 1527 – September 13, 1598) was, starting in 1556, king of Spain, Italy and Burgundy, the Netherlands, Naples, and overseas Spanish America. He was born in Valladolid, and was the only son of Holy Roman Emperor Charles V and his wife to live until he was an adult. He was Catholic. His rule was filled with troubles that caused him to be harsh on his people and other nations. For the first seven years of his life, Philip moved between different castles with his mother. In 1534 he moved into a private house in Salamanca to start his schooling. His mother died in 1539 and he took her body to Granada, where his great-grandparents Ferdinand II of Aragon and Isabella were buried. He left Spain in 1547 and moved to the Netherlands], where his father's family was from. His father wanted him to become more European but the people there thought he was too cold and serious. He married his cousin, Maria of Portugal, in (1543), They were both 16 years old. She gave him a son, Don Carlos of Spain (1545-1568) but died a few days later. He wanted to marry an English queen, so he married Catholic Queen Mary I of England in 1554. The marriage made him King Consort while she lived. Her people did not like the marriage, and Philip saw it only as a political move. On January 16, 1556, Philip became King of Spain when his father gave up the throne, but Philip chose to stay out of the country until his father died, two years later. Mary died in 1558 without children. At first Philip wanted to marry Mary's half-sister, Queen Elizabeth I of England, who was Protestant. He did not marry her, for more than one reason. Philip believed his son, Don Carlos had planned his death, so he put Don Carlos in jail. The prince died soon after, so Philip's enemies said that he had ordered someone to kill him. Some evidence shows this, but it was probably too much eating and drinking that killed Don Carlos. He died a few days after Hernando De Soto. This page was last changed on 28 September 2017, at 19:28.